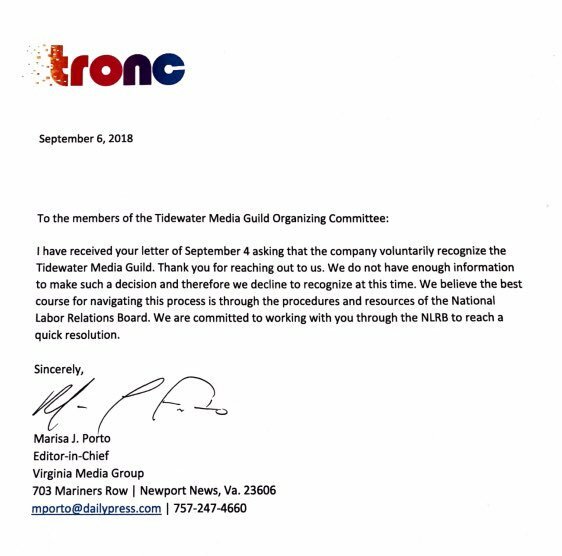 Update: Tronc has chosen to not voluntarily recognize the Tidewater Media Guild. The National Labor Relations Board will now supervise in an a vote on unionization. Journalists from the Daily Press and the Virginian-Pilot, as well small Tronc-owned sister publications such, have established a union and are requesting voluntary recognition from Tronc. On Tuesday, reporters from the Press and Pilot made public the union, the Tidewater Media Guild, that they are asking Tronc to recognize. According to the union committee, they have commitment cards from 83 percent of all eligible employees. The committee has asked Tronc to recognize the union by Thursday morning so that negotiations may begin soon (Update: Tronc has declined to voluntarily recognize the Tidewater Media Guild. The National Labor Relations Board will now supervise in an election where eligible employees will vote for, or against, unionization. Other larger Tronc publications, the Chicago Tribune and the LA Times, have made attempts toward unionization with varying results. In Los Angles, Tronc sold the paper and its sister publications; in Chicago, the company chose to recognize the union. Andy Bitter, the former Roanoke Times sports reporter who is being sued by the BH Media on behalf of the paper for access to a Twitter handle, is now countersueing the paper for defamation for upwards of $150,00, the Richmond Times-Dispatch reported. Earlier this month BH Media, on behalf of the Roanoke Times, filed a lawsuit against Bitter for access to the Bitter’s Twitter account (@AndyBitterVT), which has more than 25,000 followers. BH claims that the account is its property because Bitter, when working at the Times, inherited it from a previous reporter. When Bitter left the paper to work for The Athletic, he did not turn over access to the account. Bitter’s defamation suit revolves around an article the Times published shortly after its suit against Bitter became public. There’s more news from the Hampton Roads area as Tronc continues to merge the operations of the Virginian-Pilot and the Daily Press. Tom White, a former sports editor at Pilot, will now serve as editor of Inside Business and business editor for the Pilot, the Press and TidewaterBiz.com. These publications are now in Tronc’s new holding company for its southeastern Va. properties, Virginia Media. “Sports has been my professional focus for much of my career, but I’ve been a closet business junkie since the 1980s. That’s why I’m far more likely to have CNBC on my TV in the morning than ESPN,” White told the Pilot. White has been with the Pilot since 1997. Jami Frankenberry will now head the Pilot’s sport’s department. As previously mentioned in this section, former Inside Business publisher, Mike Herron, has stepped down. The South Hill Enterprise will now be published once a week instead of twice weekly, the paper’s leadership announced earlier this week. Elliott Robinson, a former editor at the Daily Progress, is now working as news editor for Charlottesville Tomorrow. Robinson left the Daily Progress earlier last month.